Why would you want to spend your leisure time trying to keep on top of your gardening when we have a really cheap solution for you. From garden maintenance through to a full landscaping service, you won’t believe our low, low prices for a highly professional job. 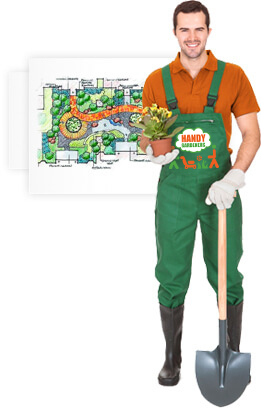 Handy Services has been established in London for many years and there are hundreds of gardens that have been tended to by our highly qualified gardeners. We have teams that will come to your home or office building on a regular basis or for just a one-off tidy-up visit and you’ll be amazed at our best value prices. Our customers come back to us again and again because they know they won’t get better value anywhere else in the district. For a free consultation, call 020 3793 4888 today and we’ll give you an incredible price! Experience is worth a lot of money! You have the peace of mind that our teams care about the quality of their work. They will use their experience to guide you and show you the potential of your outside spaces. We save you money because we get on with the job at hand. Our gardeners have all met with quality testing standards and guarantee a professional job. Our reputation precedes us because we’ve been working in gardens all over the district for more than 10 years. Our vans are recognised across the region and our name represents the best value for money. You may just have a few windows you would like planters made for or you might want your whole garden re-invented. We have great value gardening services for whatever your requirements. Our experienced gardeners have been background checked to ensure they have the qualifications and experience to do a great job. That’s because they represent our company to our customers and are the face of our highly successful garden maintenance service. We guarantee customer satisfaction too because if you’re ever any less than 100% satisfied with our workmanship, we’ll get the job done to meet your approval at no further expense to you, with no questions asked! There’s only one way to guarantee your outside space looks amazing without breaking your back or your bank balance and that’s to hire our fantastic gardening services today. Your leisure time should be about relaxing, not gardening! Why should you go through the back-breaking process of catching up on your gardening over the evenings and weekends, when we offer professional and cheap services! 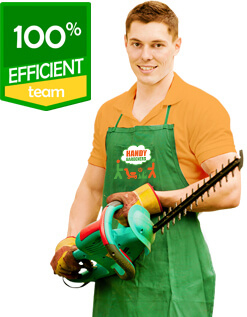 It makes no sense to break into a sweat when our gardening services are such good value. Our teams love what they do and have studied for many years to perfect their skills. We love nothing more than our customers coming to use and asking for help to design their outside space, even if it’s a hanging basket! Everything we do, we take a lot of pleasure and satisfaction from. We like to stand back at the end of the day and feel great about what we’ve achieved. That’s why everyone knows Handy Services as being the most professional gardening service across the local area. Don’t just take our word for it though! 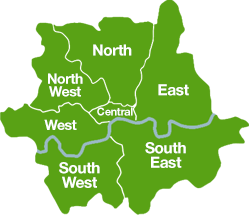 Call 020 3793 4888 now for a free quote and we’ll work out a great deal for you!